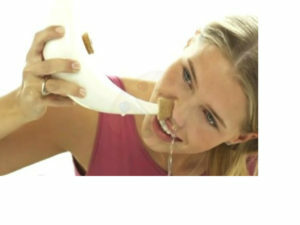 frequent use of neti pots increases sinusitis. Regular spraying with xylitol works much better. Ask for it at your local health food store. Nasal irrigation of bacteria is not a good idea; tweaking them is better and can affect biofilms as well. Talal Nsouli, the Washington D.C. Ear Nose and Throat doctor who took care of President Clinton and his allergies, also wrote about the use of a xylitol containing nasal spray and how it helped resolve chronic rhino-sinusitis in his patients. We wrote about this study in our blog at commonsensemedicine. We didn’t mention an earlier study he had done, which actually cued him in to doing the one using xylitol. In this earlier study he looked at his patients who used another commonly recommended treatment for chronic sinus problems–irrigation, most commonly with a neti pot. antibiotic-like substances that address invading pathogens. Daily aggressive irrigation tends to remove this protection. It reminded me very much of the story Jesus told (see Matthew 12 and Luke 11) about a man who cleaned out his devils (read bacteria here). The devils wandered around for a while and then passed by their original host and seeing an empty and swept house recruited other devils, more evil than themselves, and re-entered the man. He was worse off after than he was before. This parable is a very accurate portrayal of what happens in our bodies in this day of antibiotics–which we use to get rid of the bacterial devils that infect us. Protective bacteria (good devils?) are concentrated in our bodies at our openings where we are the most vulnerable. Lactobacillus vaginalis protects the female genitourinary tract from infections and provides a healthy bacterial start for the babies delivered via the birth canal. These are not devils; they are protective bacteria–commensals with a benefit. But we used to recommend washing them our regularly, until we recognized that, very much like Nsouli’s sinus patients, the women got worse without their protective bacteria. Similarly, a variety of friendly bacteria live in the upper airway, and a different variety live in our GI tracts. They protect us both by being there, so the house is not swept clean and empty, and by often secreting antibiotic chemicals that keep infecting bacteria away. Dr. Nsouli and I both agreed that tweaking this environment was a far better option than irrigation and that xylitol was an excellent choice to do this. His focus was on sinus infections while mine was on ear infections, but both of these conditions begin from bacteria that commonly live in our noses without causing any problems; the focus for both should be in the nose. Way back when I began working with xylitol I talked with Matti Uhari, the Finnish doctor who showed it to be effective in preventing ear infections. He showed that chewing xylitol sweetened gum five times a day prevented about 40% of ear infections. My study showed that using xylitol nasally at every diaper change prevented more than 90% of ear infections. Dr. Uhari told me about his then unpublished study about how xylitol decreases the adherence of nasal pathogens. Most of our pathogens hold on to us by binding with a sugar complex on our cell surfaces. Knowles and Boucher described how the mucus in our noses is filled with sugar complexes that can bind with almost any foreign allergen or bacteria. Xylitol looks like many of these sugars and is flexible so it can fit into these bacterial hands. The nice point about this is that the bacteria are happy when they are holding on to a sugar, so there is no stimulus to develop resistance. Uhari’s group showed that a 5% solution of xylitol decreases the adherence of the major pathogen, Streptococcus pneumoniae, by 68%. That, and the fact that it promotes our own mucins and cleaning, are the main reasons why our spray is so effective. Now there is a new study from New Zealand looking at what xylitol does to some of these bacteria. They looked specifically at the bacteria, Staphylococcus epidermis and aureus, and Pseudomonas aeruginosa that participate in the biofilms in the sinuses that cause the chronic nature of the problems. When an infection begins it is most often from a single bacteria that gets into a place where it can hold on and multiply. If it can evade detection by the immune system it can grow into a colony, often made up of different kinds of bacteria. When this colony senses a threat it builds a matrix around the colony that protects it from outside threats; it becomes a biofilm. This protective cover even prevents antibiotics from affecting the bacteria living in the biofilm; penetrating a biofilm with antibiotics often requires a dose of antibiotic that is toxic to the person. We need another way to cope with problems associated with biofilms. Ear and sinus infections fit here since biofilms have been associated with chronic infections in both. Implanted devices like pacemakers and joints are also at risk. With no help from antibiotics that can’t get into the biofilm to kill the bacteria implantable devices general need to be removed to get rid of the infection source. But you can’t do that with biofilms in the sinuses and ears. That’s why these doctors looked at xylitol. One of the first experiences I had with a biofilm like this was with a young lady whose asthma was triggered by a chronic infection in her sinuses. We had her use our nasal spray four times a day and about a week later, while Mom was washing her hair, she had an episode where she coughed and gagged and vomited and eventually got rid of some thick tissue-like material. Mom said it looked like she was losing her brains. But in the following week she had no problem with asthma. She stopped taking her asthma drugs and six months later she was still an active teen ager with no asthma. What happened to her is confirmed by this New Zealand study: xylitol reduces biofilm mass and formation. If you have such a problem it is important to use a xylitol containing spray where xylitol is the first listed ingredient after water. There are some claiming xylitol on the label but without a helpful amount. And use it often! What you are doing with this xylitol is kind of like negotiating with bacteria and the more often you talk to them the better they respond. Ask for it at your local health food store.